Unit 98 weeding party, 2003. At our 2019 Opening Night Party & Auction on February 19, we will be honoring the efforts and accomplishments of the Arboretum Foundation units. It would be difficult to imagine the Arboretum we all love and cherish today without the hard work and dedication of our unit members. We owe them a debt of gratitude. The Arboretum Foundation units have been described as study circles, garden clubs, and some of the most influential grassroots leaders within our Arboretum community. They are groups of women, and sometimes men, who coalesce around a love of plants, gardening, and good company—and “translate that common interest into active support of the Arboretum” (Arboretum Bulletin, Spring 1963). The story of the units is almost as old as Washington Park Arboretum, which formed in 1934. Unit 1 was created in the late 1930s by Juanita Graham, the wife of Donald Graham, one of the original founders of the Foundation. She modeled the units on the guilds of the Seattle Children’s Hospital to enable women to become more actively involved with the Arboretum. From the beginning, the units would meet regularly, study and promote horticulture, and raise money for—and public awareness about—the Arboretum. During the annual Work and Fun Day, hundreds of unit members would come to Arboretum to pull truckloads of weeds; it was like today’s Day of Caring event—but with comedy hats! 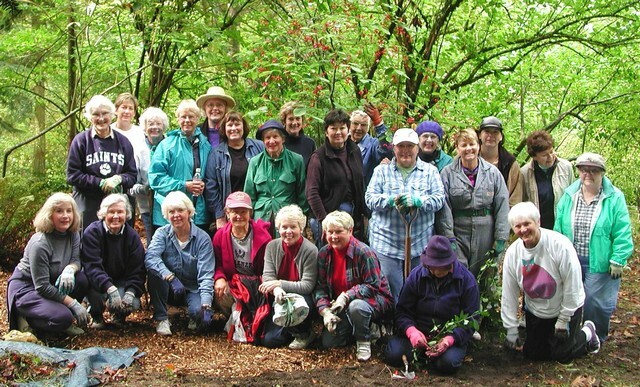 For many decades, the units provided the main organizational structure and supervision for volunteers at the Arboretum. Unit members staffed Arboretum Foundation fundraising events, helped with grounds maintenance, cleaned buildings, prepared herbarium specimens, packaged seeds for the Arboretum’s seed exchange program, and much more. In the 1960s and 70s, the Unit Council developed innovative outreach programs to area schools, hospitals, and nursing homes. Volunteers would bring “treasure boxes” filled with soil and plants into classrooms, pediatric wards, and retirement communities to cultivate a love of plants and provide horticultural therapy to those in need. 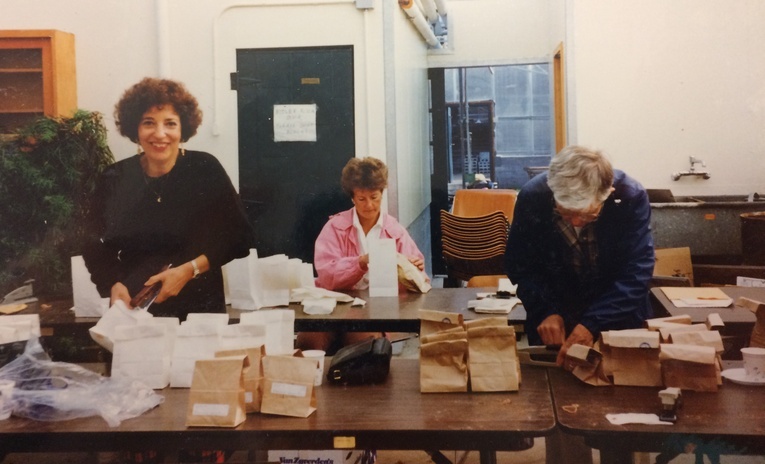 Through their own smaller events, and by collecting monthly dues, each unit would raise important funds for the Arboretum. Over the years, many, many gifts in the range of $30 to $300 dollars paid for maintenance equipment, plant material, park benches, office supplies, color maps of the park, books for the Arboretum library, travel expenses for staff, and more. Each year, the Unit Council would award a trophy to the unit that contributed the most service to the Arboretum. Today, although some units have retired, 14 remain active and provide valuable support for Foundation events and activities. Unit 86 continues to lead guided tours of the Seattle Japanese Garden. The units also continue to raise important funds! 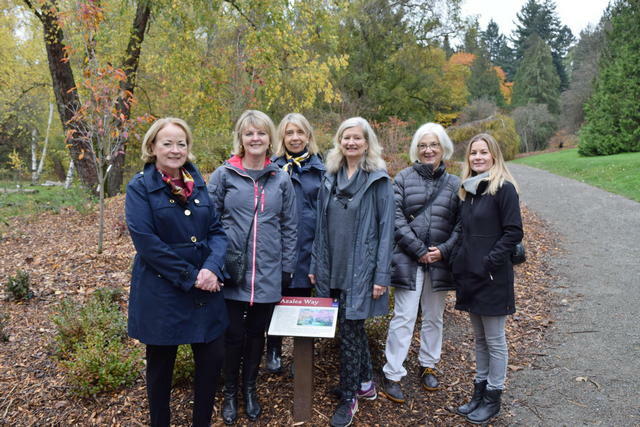 Just this past year, Unit 26—the Lillian McEwan Unit, based on Bainbridge Island—donated $12,500 to pay for a new planting bed on Azalea Way and also to sponsor the 2019 Opening Night Party. Unit 26 funded a new planting bed on Azalea Way, 2018. Thanks to our units for all they have done and continue to do for the Arboretum! Late 1930s—Unit 1 created by Juanita Graham. She modeled the units on the guilds of the Children’s Orthopedic Hospital. 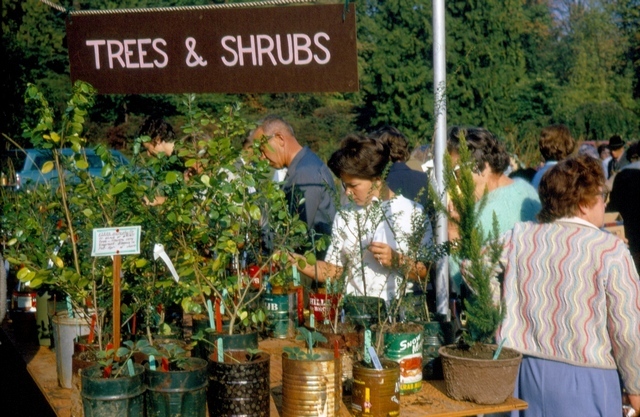 1947—The Unit Council (a coordinating body comprised of officers from each of the units) planned and produced the first Arboretum Plant Sale—the Foundation’s key fundraising event for many decades. 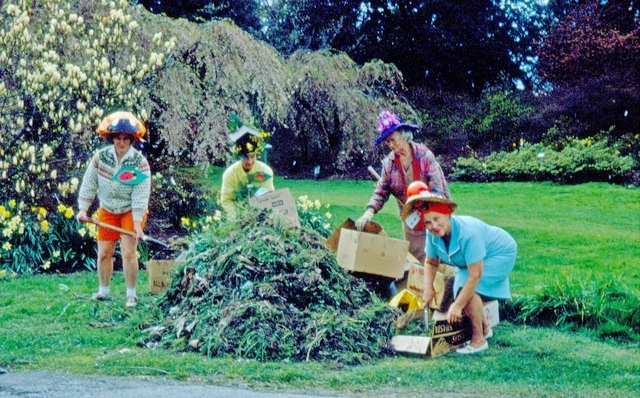 1957—The units’ annual Work and Fun Day brings 300 volunteers (in funny hats) to weed and care for the Arboretum. 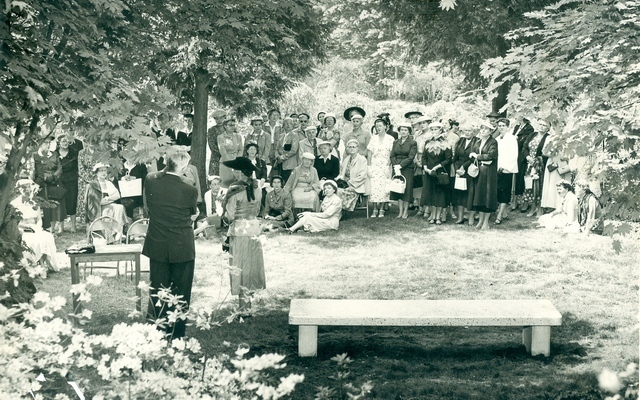 1957—A number of units band together to raise money for 12 new stone benches in the Arboretum. 1959—With the blessing of the City, University, and Foundation, the Unit Council builds the Pat Calvert Greenhouse to teach plant propagation and sell plants to support the Arboretum. 1961—Unit Council launches the Garden Guide program to assist University staff in providing free public tours of the Arboretum to children and adults. 1962—The Guided program is expanded to include tours of the Seattle Japanese Garden. Unit 86 continues to provide tours of the garden today. 1969—The Unit Council develops the Arboretum herbarium, originally conceived in 1935. 1969—The Unit Council starts its School Visitation Program to foster the love of plants and nature in elementary school classrooms all around the Greater Seattle area. 1970—The Unit Council launches an annual fall Bulb Sale. By 1973, the sale is netting $3000 per year for the Arboretum. 1976—Unit Council volunteers make monthly visits to children’s hospitals and nursing homes as part of the Hospital Visitation Program, an extension of the School Visitation Program. Unit 16 prepping for Bulb Sale. 1987—Unit Council education chair starts the Saplings Program (now the School Field Trip Program) to provide guided tours and classes specifically developed for area school children. In first year, the program serves 2,120 kids representing 72 classes and 24 schools. 1997—Units fund tree preservation and enhancements in Rhododendron Glen, the Magnolia Collection, and Azalea Way. 2007—Unit 86 works with the Foundation and City to raise more than $1 million for a new entry gatehouse at the Japanese Garden. 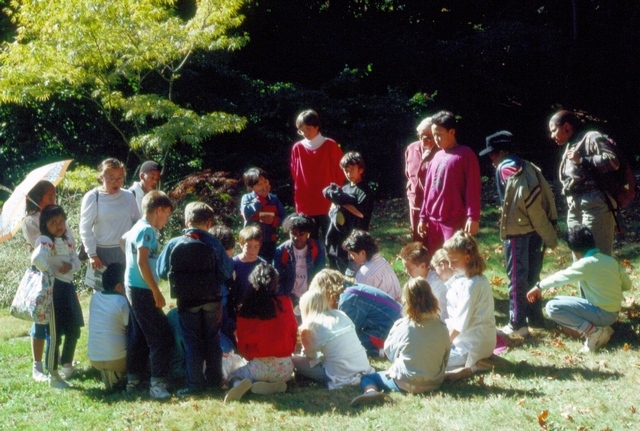 The Saplings Program (school field trips), 1989. 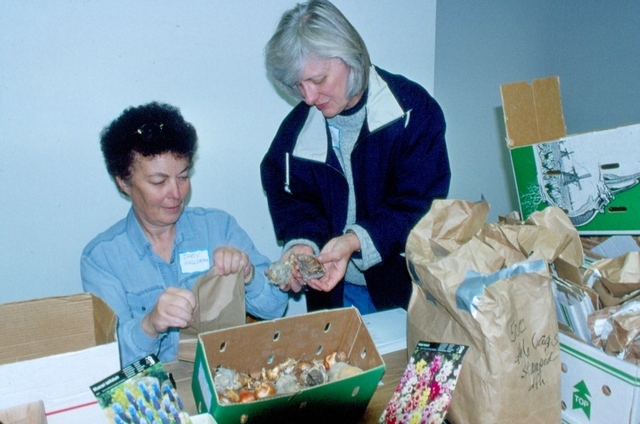 2008—Units 41, 79, and 24 host the member party and canteen at the FlorAbundance Plant Sale. 2009—Unit 96 hosts a bocce ball tournament and raises $5000 to support the Foundation. 2014—Unit 98 raises $2,300 for the Arboretum through a book sale. 2018—Unit 26 raises $12,500 to pay for new planting bed on Azalea Way and to sponsor the Opening Night Party.